Heb 10:9 "He takes away the first that He may establish the second." About this New Covenant: This is not "Old Covenant, Part 2." This is not a continuation of the Old Covenant. This is not a mixture of two Covenants. This is not a "new" way to do the same old thing. This is not an amendment to the Old Covenant. This is not "picking up where the old left off." This is a completely different covenant. This is "a better covenant, which was established on better promises." (Heb 8:6). The old system of a priesthood of mortal men (see Heb 7:23-25 "prevented by death from continuing"), and everything that went along with it, served a purpose under that old covenant, but it is now done away with. The old tithing system that was set in place to provide for the Levites, widows, orphans and strangers, served its purpose under that old covenant, but it is now done away with. All of the sacrifices, which had a purpose under that old covenant, have now been done away with. The curse of the law has been done away with. In fact, the Law has been "wiped out," "taken out of the way," "nailed to the cross." (Col 2:14). Did Paul really say that? YES HE DID! Trying to be obedient to God's Law has been done away with. Man's relationship with the law altogether has been done away with! One has to be dead to the law in order to be married to a completely different spouse, Jesus Christ. (Rom 7:1-6, Gal 2:19-20). They are not the same, and you cannot be married/joined to both. God's law was "a shadow of of the good things to come, and not the very image of the things" (Heb 10:1). It, along with the sacrifices, could never make anything perfect and could never take away sins, but really only brought about a reminder of sins! (Heb 10:2-4). JESUS HIMSELF - the PERSON - is the reality, is the substance (Col 2:17). The reality/substance is not a system of rules and laws and sacrifices, but is a Person. Jesus' one-time, once-for-all sacrifice did away with ALL of that! With one sacrifice, the system of laws and ordinances was done away with, as was the entire priestly system and the entire OLD COVENANT. "What the law could not do, in that it was weak through the flesh, God did by sending His own Son in the likeness of sinful flesh..." (Rom 8:3). Jesus Himself became a curse for us (Gal 3:13) and became sin for us (2 Cor 5:21). With one sacrifice, Jesus TOOK AWAY the sin of the world! "Behold, the Lamb of God who takes away the sin of the world!" (John 1:29). "But now, once at the end of the ages, He has appeared to put away sin by the sacrifice of Himself" (Heb 9:26). If we want to live in the fullness of the reality of Jesus Christ, we need to get out of the shadows and instead focus on the substance - the Person of Jesus Christ who IS our life and who is our light. He Himself IS the reality of the abundant life. Wow, this is a great post! About Jesus sacrifice doing away with the law - I love that! And also I have a question: Does that mean that the law was wiped out for unbelievers, too? So God is putting noone under the law or holding them to it, it's just that people put themselves under it and then feel condemned? Would that be so? It seems if that's the case there's no sense in preaching law to unbelievers to show them their sin: we just can preach grace to them and encourage them to receive the life of Christ! Am I thinking clearly on this? You know, this is something that I've been contemplating during recent months, and I've not come to a solid conclusion on it, but I'm leaning towards what you are saying: that the law is out of the way for both believers and unbelievers. There are certain scriptures that might negate what I'm thinking, but here are my thoughts. Col 2 says that the handwriting of requirements (the law) that was against us has been "wiped out," "taken out of the way" and "nailed to the cross." 1 Cor 5 says that "God was in Christ reconciling the world to Himself, not counting men's sins against them..." Romans 3:19 says that it was the law through which "every mouth" was stopped and "the whole world" became guilty before God. And so with the law taken out of the way, God is no longer counting men's sins against them. I believe this includes everybody. However, I don't believe that all have come to Christ by grace through faith, and have been born again and raised to life with Christ. To me, that's where the difference lies. The law has been taken out of the way, nailed to the cross. Therefore no one is kept from God because of the law. Those who are still apart from God, are apart from Him because they haven't been raised to life. The verses that might negate what I'm saying are those who talk about people (specifically Jews) who are "under the law." For example, Paul says in 1 Cor 9:20 that "to the Jews I became as a Jew, that I might win Jews; to those who are under the law, as under the law, that I might win those who are under the law..."
This could mean that there are literally still those who are "under the law." I could also mean that they reckon that they are under the law, and so Paul comes to them in that manner, hoping to convince them of the gospel of grace. All that to say, I'm still working through my thoughts on this, and don't have a solid conclusion, but I'm leaning toward the view that the law is completely done away with for all. This helped me a lot. I agree with you that if it is true that the law is done away with for all, that doesn't mean all are saved. People still need the life of Christ which is received by faith. That said, if the law is truly gone, then it makes telling the gospel very good news indeed because the focus is all on what Christ has already done and the offer of Life. Good to get the thoughts of a "grace expert" on this! Thanks! Joel, I would sincerely like to thank you for articulating so well what I believe. WELL DONE!!! I like like-minded minds because like-minded minds think alike, like like-minded minds! Hi Joel, I think the law discussion is very interesting. Hebrews seems to say the law has not yet disappeared but is obsolete and will soon fade away. Also, 1Tim says the law is good if used lawfully, that is for the unjust not the just. I personally lean toward the idea of using the law with religiously self-righteous people who think they are good enough on their own or with just a little help from the HS to keep the law better. I hear what you're saying though. Not sure the law is relevant to your average unbeliever on the streets. They just haven't heard the good news yet! Yeah, Jul, I think it's worth talking about. Your second comment is essentially what I'm tossing back and forth in my mind. The thing that charged mankind with guilt was the law. Paul now says that God was in Christ reconciling the world to Himself, not counting men's sins against them. Along then with Colossians saying that the law was "nailed to the cross" and "taken out of the way," etc, I wonder if indeed the law's job has already been done "once and for all" (charging all of mankind with sin), and now on the cross, all of man's sins have been eradicated. That doesn't mean that all are saved, because that doesn't mean that all have been resurrected/risen with Christ to Life. And so yeah, my thinking is that the Law is truly no longer in the way between man and God at all. It's only an issue for those who themselves make an issue out of something that has already been done away with. Still thinking it through, but that's basically where I'm at. 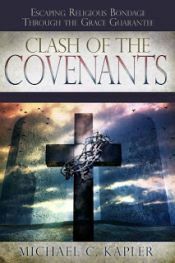 The covenant at Sinai and the new covenant are both relevant to Jews only. Gentiles never were beholden to the law of Moses any more than Germans are beholden to the laws of Panama. Nor does the new covenant have anything to do with gentiles. I essentially agree with you, for the most part, about the law, but there is one way in which I see God's law having applied even to Gentiles. Paul says, "Now we know whatever the law says, it says to those who are under the law that every mouth may be stopped and the whole world become guilty before God. So technically, Gentiles have never been "under the law," but yet "the whole world" (including Gentiles) became guilty before God because of the law. As for the new covenant not having anything to do with Gentiles, I understand the promise of the New Covenant that was made solely to Israel, but I do believe that the Gentiles have been let in to that covenant. When Paul says that it speaks to those under the law, he is saying that the Psalm ("no not one") was only addressing Jews. In the previous chapter he deals with the gentiles, who are beholden only to conscience. So the combined effect of the conscience for gentiles and the torah for Jews renders the whole world guilty. >>>...but I do believe that the Gentiles have been let in to that covenant. But on what basis? Just because you "believe" something does not make it true. I would point out that the verse you quoted, Rom 3:19, does indeed say that the law speaks only to those under the law, but it also does say "that the whole world might become guilty before God. Not everyone has been under the law, but through the law the whole world was made guilty. Other than that, you're right that just because I believe something, that does not make it true. Same with any statement you make, such as "Nor does the new covenant have anything to do with gentiles." In chapter 2 he indicts the nations by their consciences and in chapter 3 he indicts the Jews. In this way, by these combined charges, he indicts the whole world. The law alone does not indict the world, because the nations are not beholden to the Jewish law/covenant terms. Yeah I can see that particular aspect of what you're saying. "I will also make You a light of the nations so that My salvation may reach to the end of the earth. Thus says the Lord,'In a favorable time I have answered You, and in a day of salvation I have helped You; and I will keep You and give You for a covenant of the people," (Isaiah 49:6,8). “I am the Lord, I have called You in righteousness, I will also hold You by the hand and watch over You, and I will appoint You as a covenant to the people, as a light to the nations" (Isaiah 42:6). I have made you a light for the Gentiles, that you may bring salvation to the ends of the earth. Yep, good stuff Kap. We've been seeing these things in the scriptures lately regarding the whole Jew and Gentile thing... things that have refined our thinking and helped our understanding during the past five years, since the time this post was written. The Old Covenant was based on the Jews being able to keep their part, but as you say, the New Covenant has nothing to do with mankind (whether Jew or Gentile) keeping their part, because it's all based on an oath that God, who doesn't lie, made to Himself. Reading through the earlier comments here, I have a response that I'm not sure why I didn't share it back at the time (during this conversation in 2010). But one reason why I believe Gentiles have been let into this new covenant is because of the verses that Kap mentioned here, and in addition to that, Jesus said that His cup was "the new covenant in My blood, which is shed for many for the remission of sins" (Matt 26:28), and Paul later quoted these words of Jesus in his epistle to the (Gentile) Corinthians, explaining the Lord's Supper to them. He told these Gentile (not Jewish) believers, "For as often as you eat this bread and drink this cup, you proclaim the Lord's death till He comes." And in his next epistle to the Corinthians he wrote, "our sufficiency is from God, who also made us sufficient as ministers of the new covenant..." Not only are Gentiles partakers of the new covenant, but they are also ministers of it.